Dr. John Patrick Higgins received his medical degree from the University of Queensland Ochsner Clinical School in Australia. He holds a Master’s in Philosophy from the University of Cambridge in England. In addition, he earned a Master of Business Administration from The George Washington University in Washington, D.C., where he graduated with honors and was inducted into Beta Gamma Sigma, an international honor society that recognizes business excellence. Board certified in internal medicine and cardiovascular disease, Dr. John Patrick Higgins is a Clinical Exercise Specialist® and a Certified Personal Trainer® through the American College of Sports Medicine (ACSM). In addition, he is a fellow of the American College of Cardiology (ACC), the American College of Physicians (ACP), the American Heart Association (AHA), the ACSM, the American Society of Nuclear Cardiology (ASNC) and the Society of Geriatric Cardiology (SGC). 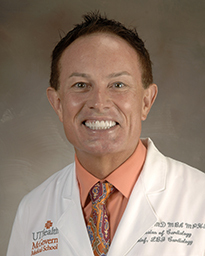 Dr. Higgins serves as the director of Exercise Physiology at the Memorial Hermann IRONMAN Sports Medicine Institute, an associate professor in the Division of Cardiovascular Medicine at McGovern Medical School at UTHealth and chief of Cardiology at Lyndon B. Johnson Hospital. He is also a sports cardiologist and works with the Houston Rockets and Rice University Athletics. He is the author of 45 manuscripts, 50 web based publications, 3 YouTube, 13 abstracts, and has had seven articles published in the Houston Chronicle newspaper. Additionally, Dr. Higgins has appeared 500+ times on local radio and television, including CNN and ABC World News. His book Cardiology Clinical Questions assists cardiology fellows with diagnostic questions. A passionate educator, Dr. Higgins has received the prestigious Dean’s Teaching Excellence Award at McGovern Medical School seven consecutive years. He also accompanied the fourth year medical students on their away elective to Beijing, China. His research includes (1) screening young athlete’s hearts, (2) energy drinks, (3) smartphone applications and activity trackers; and (4) ultramarathons. He went on to complete an internal medicine residency at University of Missouri School of Medicine in Columbia, Missouri. Dr. Higgins then finished his cardiovascular disease fellowship with Harvard Medical School at Brigham and Women’s Hospital in Boston. Dr Higgins loves to exercise and has completed in the 10 x 10 challenge (running 10 miles a day for 10 consecutive days) as well as 13 marathons. He believes that exercise is medicine. In addition, he enjoys public speaking and was a previous president of the Boston Toastmasters.